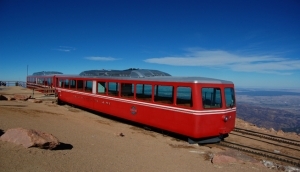 Manitou Springs is hoping to get up to three railcars from the Pikes Peak Cog Railway. The train is being replaced, and Manitou City leaders hope to possibly use one of the old cars as a COG Railway Museum. The cars and other equipment must be removed by February 22nd. The Gazette reports, other ideas include turning them in food trucks or a café. The railway is scheduled to reopen in May 2021.